Hayda Blasir, age three, and Nicky Blasir from Sturgeon Bay. Andy Rubin of UW – Madison’s Tandem Press demonstrating screen printing at the Peninsula School of Art’s Family Art Day in Fish Creek. Photo by Len Villano. 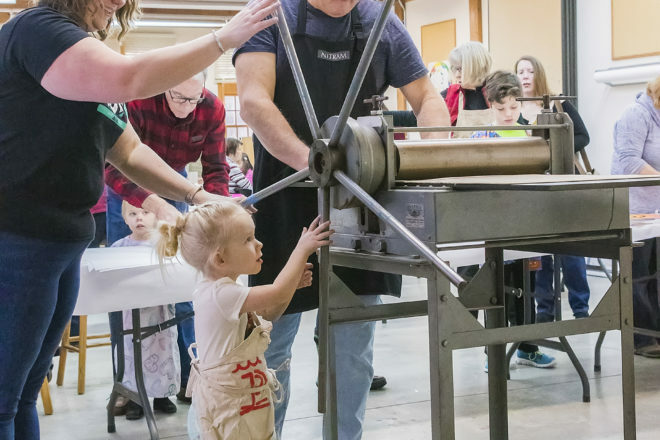 Andy Rubin, of the University of Wisconsin – Madison’s Tandem Press, was the guest artist at Peninsula School of Art’s Family Art Day on Jan. 19. Rubin demonstrated screen printing and helped kids create their own hand-printed Valentine’s Day cards. Rubin is one of the featured artists in the Peninsula School of Art’s current exhibit, Midwest Made: Contemporary Print Invitational. More printing fun is in store on Feb. 2 during the school’s Winter Print fundraiser. During the event, to be held 10 am – 2 pm, people will be able to pull their own screens on T-shirts, color a pre-printed T-shirt or create a block print on a T-shirt or tote bag. Family Art Days are free and held monthly, usually on the third Saturday of the month, from September through May. For more information and a list of Family Art Days, go to peninsulaschoolofart.org.